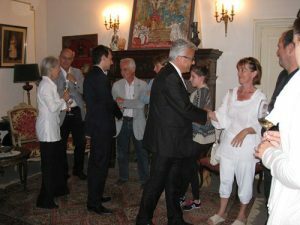 Source of pride for Nathalie Jeannot, Director of the domain of Villenouvette, the inauguration of the first cuvée of the Chapel of Novilis took place Friday, June 7, 2013; in Maraussan, in the presence of Elie Aboud, deputy of Herault. The attention and care given to the quality of wine production in the region has grown in recent years.
. A 30-year-old winemaker to work on the renewal of the estate; who had not produced his own wine for 40 years. The estate was bought in 1950 by the Maury family and developed in the 1960s by Henriette Maury and her husband René Pegolotti. In 1990, their youngest son Laurent worked on improving the condition of the vineyards in cooperation with the winemakers of the Pays d’Ensérune. A work that is bearing fruit today with this vintage. In a beautiful setting in the heart of the vineyards; the member tasted this wine with pleasure and welcomed the initiative of this family. A batch of red wine will expand the range in 2014. Do you want to follow the news at CHAPELLE de NOVILIS?